It is May the 15th and Thessaloniki’s Spring Demo Day is here. 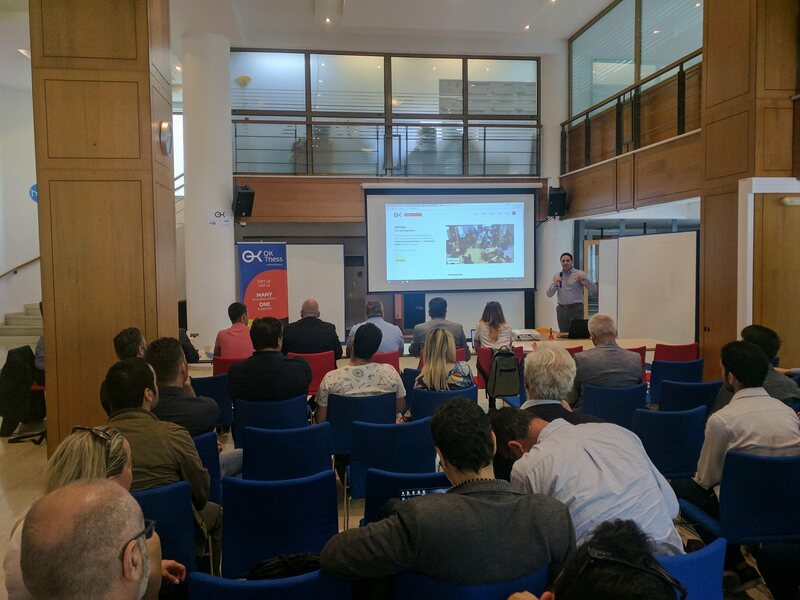 OK!Thess has already invited all of Thessaloniki’s startup support programs and organizations to propose some of their best startups for pitching to a group of invited Venture Capital funds and business angels from Greece and South-East Europe. Τhe Demo Day starts with a roundtable discussion at 10:00 am. Invited business angels and VC fund managers share thoughts on potential collaborations at a regional and global level. After a short round of introductions, the discussion jumps into a brainstorming phase on ways of empowering startup founders in the Balkans with the hard and soft skills needed in order to start-up, build global and sustainable businesses, grow, and generate value for the region. It’s around 12:00 pm and the 12 startups who are going to pitch to investors have already arrived. They are busy with networking and last minute changes to their presentations. Pitching starts and teams have only 10’ to explain their solution, impress investors and get asked for a 30’ one-to-one meeting later in the day. Movvin (via Coho) offers integrated solutions to Road Transport Operators (RTPO) and especially those who are active in the Tourism sector. ErgoSensePro (via Technology Park) evaluates athletes’ movement and develops customizable training programs for coaches and trainers of professional sports teams. myAlgos (via ACT) combines mobile and web technologies with the internet of things devices to enhance communication and collaboration between chronic pain patients and their medical team. Cubes Coding (via OK!Thess) develops Robotiles - a system that makes programming education fun and effective by combining tangible programming instructions (tiles) with robots. EmbIoTs (via i4Gpro) is an embedded IoT solution for construction power tools that helps users track where the tools are, how they are being used and when they need maintenance. Elektronio (via ACT) redefines conventional bicycle & combines two trends in the bicycle market, electric & cargo. Callibrie (via Atlantis) is a mobile application acting as an Intelligent Personal Assistant that predicts its users’ communication needs and satisfies them at the exact moment they are born. Grekaddict (via OK!Thess) - is the place for high-quality unique travel experiences. PLiN (via Auth) is a research-driven spin-off company of the Aristotle University of Thessaloniki, specializing in the fabrication and characterization of tailored metal and oxide nanoparticles. Turnand Peripherals (via i4Gpro) is a hardware startup that designs and develops smart peripherals for smart devices that overcome everyday obstacles and enhance user experience. Yummy Wallet (via Atlantis) is a crossover between a mobile payments app and a loyalty rewards service. Loceye (via OK!Thess) helps businesses understand how their customers use online products and how they interact with visual elements on a screen, using remote Eye Tracking analysis. It’s around 3:00 pm and an additional 11 startups arrive. Τime for office hours and one-to-one meetings with investors! Investors select the teams they would like to meet with, the timetable is announced, investors take their places in separate meeting spaces inside OK!Thess and teams start rotating to meet with them - for 30’ each. A total of 55 one-to-one meetings take place within 4 hours. Exoha (via Perrotis College) develops an AI-based scheduling solution that offers unique features for employee shift allocations. Openhouse (via i4Gpro) is a real estate platform that disrupts the way users search for a house and/or business space and transform this search to one of their most pleasant experiences - the way it should be. Project Veltio (via OK!Thess) designs a new cooking solution for boneless meat that utilizes thermodynamic principles and intelligent control to achieve the desired cooking results every time. Legalpal (via OK!Thess) is a web-based platform helping users find and hire the right lawyers for their needs, while also allowing users to generate legal documents online, through a series of questions. Nabz (via OK!Thess) is a fun new way to help foodies decide where to eat. Rhoe (via OK!Thess) offers a hardware and software solution that assists mid-sized municipal authorities to issue and handle parking fines faster, by automating the end-to-end process. Proclisis (via OK!Thess) is a software service for small and mid-sized enterprises that handle large volumes of complex purchases every month through small procurement departments that are typically understaffed. AidPlex (via OK!Thess) manufactures thermoplastic splints for healthcare organisations and professionals to provide their patients a lightweight, reshapeable and recyclable alternative to conventional solutions. Skilz (via OK!Thess) develops a tool that enables asynchronous communication between educators and their students with online video. K-INVENT (via OK!Thess) creates connected devices for physical rehabilitation that enable therapists to improve - and demonstrate - the results of their work while making training fun for their patients. Octappush (via OK!Thess) aspires to be the online community for mobile app users/gamers and developers. The one stop for users to rate, comment and discuss their favorite (or not) apps/games.